Hosted by the Rapid Response Team, hundreds of law enforcement officers and their spouses attended the National Law Enforcement Retreat at the Billy Graham Training Center at The Cove on Oct. 21-23. From the shootings in Parkland, Florida, to the more recent one in Florence, South Carolina, law enforcement officers have the increasingly daunting task of maintaining peace in a sinful world. And while they continually drop everything to answer cries for help in the rush of an emergency, their own needs often fall to the wayside. 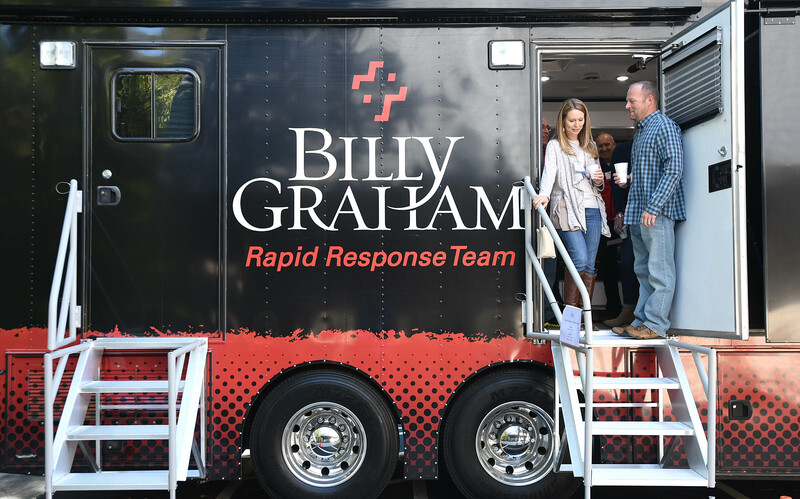 That’s why the Billy Graham Rapid Response Team (RRT) gives officers and their spouses the opportunity to bring their emotional and spiritual needs to the forefront of their lives at the National Law Enforcement Retreat (NLER) for three peace-filled days each year. On October 21-23, more than 300 officers and spouses from across the country and Canada attended the fifth-annual retreat at The Billy Graham Training Center at The Cove in Asheville, North Carolina. After seven 40-minute talks with active duty and retired law enforcement officers and the wife of a law enforcement officer, attendees were able to receive a fresh view on life in multiple ways. Vonnie made the 14-hour drive from the flat terrain of Durant, Oklahoma, to the retreat cradled in the beautiful Blue Ridge Mountains with her husband, David, who serves as the chief of police in their town. After attending the first year of the retreat back in 2014, the couple found themselves returning nearly every year. While the instruction is helpful individually, it also has aided their marriage. Law enforcement officers and their wives enjoyed talking with the chaplains inside the MMC, or Mobile Ministry Center. Furthermore, the sessions have encouraged them to reach beyond themselves, and out into their community as Christians. “With law enforcement, you wouldn’t think you have opportunities [to share the Gospel], but every time I meet someone there’s an opportunity. Like there’s training to be a police officer—this equips us to minister to people,” Vonnie said, adding she’s often able to counsel the 500 cadets she instructs at a police academy. Other times, the Housers have come to the retreat simply to be ministered to and to seek God’s presence, like after their youngest son, 22-year-old Dalton, committed suicide in March 2017. A year-and-a-half later, Vonnie believes God called David and her to the retreat “not just for us, but to minister to people who have been through the same thing. “Before we felt like we needed something; now, we’re here because we know God has a plan and we’re waiting to know what it is,” Vonnie said. Five years ago, this retreat began for that very purpose: spreading the Gospel message. 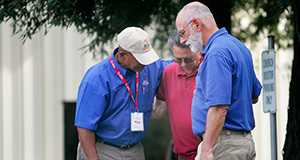 “That’s the most important thing,” said RRT Chaplain Jeff Naber, who helped develop the idea for such a retreat. 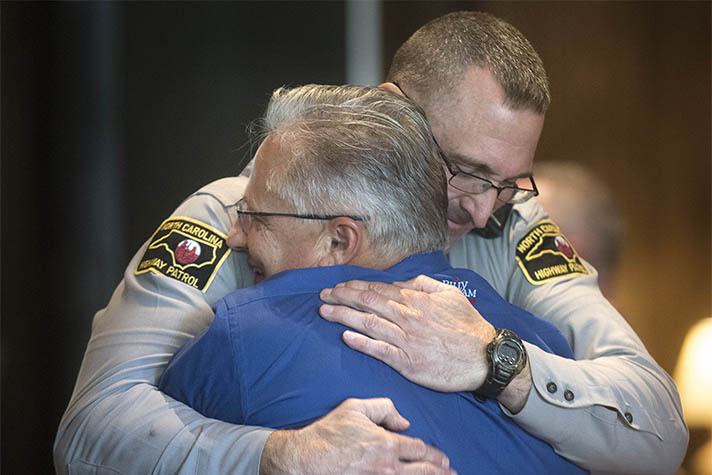 What started as a simple office conversation of what the RRT could do for law enforcement and their spouses turned into an annual event that will likely expand to more locations in the future, Naber explained. While many existing programs offer emotional help, there are very few that provide spiritual care, or “fitness,” for officers and their families as the RRT does. “God’s really got us on a real uptick for ministry in law enforcement,” Naber said. He’s working toward meeting the needs of law enforcement, which are quickly outweighing the RRT’s current capacity. As the RRT continues to grow and support law enforcement through different avenues, they are not letting the world’s disasters discourage them. Instead, they’re choosing to look for strength in the midst of weakness and hope during hard times. No matter what you’re facing, God is there. Start a relationship with Him today.